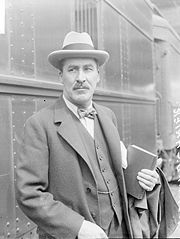 Howard Carter (May 9, 1874 – March 2, 1939) was an English archaeologist and Egyptologist who spent nearly 50 years unearthing historical tombs and artifacts. Although he received no formal education of any sort, Carter became one of the foremost archaeologists of his time. His early work involved excavations in the Valley of the Kings, where he was responsible for much of the work on the tombs of pharaohs Hatshepsut and Thutmosis IV. He is famous as the discoverer (supported by Lord Carnarvon) of KV62, the tomb of Tutankhamen in the Valley of the Kings, Luxor, Egypt. This find attracted the attention of the world, with the early death of the young pharaoh and the beauty of the artifacts capturing people's imagination. The British Museum exhibition of the treasures of Tutankhamen, popularly called the "King Tut" exhibit, attracted over 1.5 million visitors and re-invigorated the field of Egyptology. Carter's efforts established a new trend in archaeological practices of preservation, which together with respect for descendants of ancient cultures has led to greater understanding of the significant civilization of ancient Egypt. Howard Carter was born on May 9, 1874, in Brompton, Kensington, London, the youngest son in a family of 11 children. His father, Samuel Carter, and grandfather, Samuel Carter Senior, were gamekeepers on the estate of the Hamond family, the lords of the manor of Swaffham. His father became a prominent artist as did his brother William Carter (1863–1939). His mother was Martha Joyce (Sands) Carter. Howard Carter was raised in Swaffham, in northern Norfolk, with his two aunts because the climate in London did not agree with him. He was a sickly child, and because of his ill health, he was taught privately at home, his father training him during his frequent trips to Swaffham in the fundamentals of drawing and painting. Thus, Howard never received a formal education. One of his father’s patrons was William Amherst Tyssen-Amherst, a member of parliament from Didlington Hall near Swaffham. Howard accompanied his father to the Hall to watch him paint, but when he became bored he spent time in the Egyptian room looking at the collection Amherst had accumulated over the years. It is very likely that this is where Howard’s interest in Egyptology began. The Amhersts were to be the key to Howard’s entry into the world of Egyptology as he was their recommendation to work in the archaeological sites in Egypt. Carter began work in 1891, at the age of 17, as a "tracer," for the Egyptian Exploration Fund (EEF), copying inscriptions and paintings near Alexandria, Egypt. He worked on the excavation of Beni Hasan, the gravesite of the princes of Middle Egypt, circa 2000 B.C.E. Later he came under the tutelage of the archaeologist William Flinders Petrie. Petrie, however, had little faith in Carter's ability to be a great archaeologist, but through his accomplishments, Howard proved him wrong. He carried out the explorations of the Theban Necropolis, the temple of Queen Hatshepsut (one of only four women pharaohs, who reigned from 1478 to 1458 B.C.E. 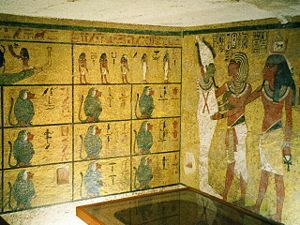 ), the tomb of Tuthmosis IV (who reigned from 1401 to 1390 B.C.E. 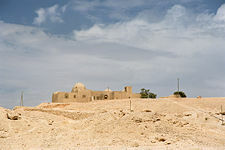 ), and the cemetery of the eighteenth-dynasty queens dating back to 1340 B.C.E. When he found the remains of Queen Hatshepsut's tomb in Deir el-Bahri, he was appointed principal archaeologist of the EEF. There he honed his drawing, excavation, and restoration skills. In 1899, at the age of 25, Carter was offered a position working for the Egyptian Antiquities Service. He was appointed first inspector general of the Monument for Upper Egypt. This job included supervising and controlling archaeological digs along the Nile River. He supervised the systematic exploration of the floor of the Valley of the Kings on behalf of Theodore Davis. Carter assisted in adding lights to six of the tombs. In 1903, Howard was transferred to the Inspectorate of Lower and Middle Egypt, with his headquarters at Saqqara. He later resigned as a result of a dispute between Egyptian site guards and a group of drunken French tourists in 1905. After several hard years, Carter was introduced, in 1907, to George Herbert, 5th Earl of Carnarvon, an eager amateur who was prepared to supply the funds necessary for Carter's work to continue. Soon, Carter was supervising all of Lord Carnarvon's excavations. The decisive moment arrived. With trembling hands I made a tiny breach… At first I could see nothing…but presently, as my eyes grew accustomed to the light, details of the room within emerged slowly from the mist, strange animals, statues, and gold—everywhere the glint of gold…. I was struck dumb with amazement, and when Lord Carnarvon, unable to stand the suspense any longer, inquired anxiously, "Can you see anything" it was all I could do to get out the words, "Yes, wonderful things." Still, Carter did not yet know at that point whether it was a tomb containing the remains of the pharaoh or merely a cache of beautiful artifacts, but he did see a promising sealed doorway between two sentinel statues. Howard Carter (kneeling), an Egyptian workman, and Arthur Callender at doors of burial shrines in Tutankhamen’s tomb. The next several weeks were spent carefully cataloging the contents of the antechamber. On February 16, 1923, Carter opened the sealed doorway, and found that it did indeed lead to a burial chamber, and he got his first glimpse of the sarcophagus of Tutankhamen. The find was reported as resplendent with furniture, vases, chariots, and other artifacts, along with a golden wall shielding the tomb intact. Tomb robbers from early times had not reached the mummy. 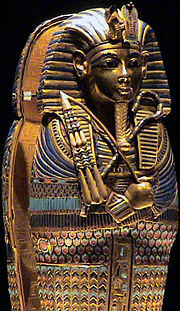 Finally, on October 28, 1925, almost three years after opening the entrance to the burial chamber, Carter gazed with awe and pity upon the mummy of Tutankhamen: "The beaten gold mask, a beautiful and unique specimen of ancient portraiture, bears a sad but calm expression suggestive of youth overtaken prematurely by death." Carter's own papers suggest that he, Lord Carnarvon, and Lady Evelyn Herbert entered the tomb shortly after its discovery—without waiting for the arrival of Egyptian officials (as stipulated in their excavation permit). Some bizarre and demonstrably inaccurate theories have been offered about the exact extent of the excavators' rule-breaking; but it seems likely that it was merely a case of impatient curiosity. It is widely accepted that their relationship with the government officials interested in their find was strained to the point where tacit non-cooperation became almost second nature to Carter. While Carter was unwrapping the linens of the mummy, presumably looking for treasure, the skull of the ancient king fell away from the body. The impact from its fall out of the tomb made a dent in the skull. Egyptians believed a king could only be immortal if the body rested undisturbed, so some believe the name of the king must still be spoken today as a remembrance. Finding the tomb of Tutankhamen, or as he came to be known colloquially "King Tut," recreated an interest in the glories of ancient Egypt. Carter reported that it was like stepping into a funeral of a 3,200-year-old king. It was no longer just scientific research but brought out the human aspect. The discovery came just after World War I, and the world seemed eager for something spectacular. He visited the United States in 1924, and gave a series of illustrated lectures in New York City that were attended by very large and enthusiastic audiences. Carter cataloged the artifacts with great care and detail, assigning reference numbers to each object according to its location in the tomb. He created complete records for each discovery, including his own sketches as well as numerous photographs of the objects in situ with and without their assigned reference numbers, and preserved each artifact with great care. Stoppelaere House in the Theban Necropolis where Carter lived. After cataloging the extensive finds, which took ten years, Carter retired from archaeology with an honorary degree of doctor of science from Yale University and an honorary membership from The Rel Academia de la Historia of Spain. After his retirement he became a collector of antiquities. Carter had received many warnings and letters about the dangers of opening the pharaoh’s tombs. The other 11 people in the party at the opening of the tomb all died within seven years of the event, including Lord Carnarvon who died in 1923. Cararvon's wife continued to fund Carter's work. Carter died in England in 1939 at the age of 64. The archaeologist's death, so long after the opening of the tomb, is the most common piece of evidence put forward by skeptics to refute the idea of the "Curse of the Pharaohs" promising death for anyone who disturbed or violated Tutankhamen’s tomb. Howard Carter was buried in Putney Vale Cemetery in West London. On his gravestone is written: "May your spirit live, May you spend millions of years, You who love Thebes, Sitting with your face to the north wind, Your eyes beholding happiness" (from the Wishing Cup of Tutankhamen). Egypt, a 2005 BBC television series featured the discovery of Tutankhamen’s tomb by Carter in the first two episodes. In Search of the Pharaohs, a 30-minute cantata for narrator, junior choir, and piano by composer Robert Steadman, commissioned by the City of London Freemen's School, uses extracts from Carter's diaries as its text. A paraphrased extract from Howard Carter's diary of November 26, 1922, is used as the plaintext for Part 3 of the encrypted Kryptos sculpture at CIA Headquarters in Langley, Virginia. The many portrayals of Howard Carter and his discovery of Tutankhamen’s tomb in popular culture helped opened up an interest in the field of Egyptology. The temporary exhibition Treasures of Tutankhamen, held by the British Museum in 1972, was the most successful in British history, attracting 1,694,117 visitors. Howard Carter was among the first archaeologists to document and evaluate his finds, preserving them intact. Many of the earlier explorers simply exploited the tombs for their wealth or personal artifacts. Carter took almost a decade to carefully preserve and remove the treasures from the tomb of Tutankhamen, showing an approach to excavation that more resembles the efforts of modern excavators than those of earlier times, although of course his methods were limited by the equipment and techniques known in his time. Although Carter died both famous and wealthy, he was never publicly honored (as other prominent archaeologists were) by the British government. ↑ Audrey Carter, Howard Carter, Archaeologist and Egyptologist: A Personal View, Ancient Egypt Magazine 4 (November/December 2000). Retrieved April 13, 2007. ↑ John Warren, Egypt Feature Story: Howard Carter, Tour Egypt! Retrieved April 13, 2007. ↑ 3.0 3.1 Howard Carter, The Tomb of Tut Ankh Amen: Volume 1: Search, Discovery, and the Clearance of the Antechamber, Reprint (Duckworth Publishing,  2003 ISBN 0715631721). ↑ Rachel Frisk, Howard Carter 1874–1939, EMuseum at Minnesota State University, Mankato. Retrieved April 13, 2007. ↑ Curse of the Pharaohs, Wikipedia. Retrieved April 13, 2007. ↑ Jimmy Dunn, Excavating the Tomb of Tutankahmun, Tour Egypt! Retrieved April 13, 2007. Encyclopedia of World Biography on Howard Carter. Howard Carter's Diaries Griffith Institute. Tutankhamun: Anatomy of an Excavation The Howard Carter Archives, The Griffith Institute. History of "Howard Carter (archaeologist)"
This page was last modified on 15 January 2018, at 17:37.